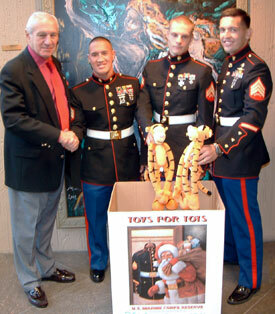 United States Sports Academy President, founder and CEO Dr. Thomas P. Rosandich poses with members of the U.S. Marines Corps Reserves during a past Toys for Tots event. Long considered the region’s largest collection center for the Toys for Tots program, local residents may bring donations to the Academy each Monday through Friday from 8 a.m. to 5 p.m. Toys should be delivered to the Christmas tree in the main lobby of the Academy at One Academy Drive in Daphne. The Academy encourages schools, clubs, associations and businesses in the area to drop off their new, unwrapped toys and help assist those who need it most this time of year. All toys that are dropped off at the Academy will be distributed to children in Baldwin County.